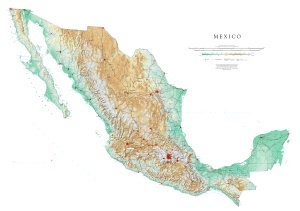 This beautiful map from Raven displays the wide range of Mexico's landforms, from Baja California through the central mountainous region to the Yucatan Peninsula. Raven's colors bring to life this country's dramatic elevation range. Included are all 31 states, capitals, cities, rivers, lakes, mountain ranges, canyons, and towns. Scale 1:2.5M - 37" x 54"